Sweet Chili Bacon-Wrapped Chicken Tenders coated in brown sugar and chili powder and then baked until crisp and delicious! Perfect as game day appetizers or as an easy weeknight dinner. We invited a few friends over today to watch the games and these sweet chili bacon-wrapped chicken tenders along with my almost-famous jalapeno poppers and crowd-favorite pineapple cheese ball made a delicious appearance. We had quite a spread of party food as ours guests brought other stuff as well but even with the tough competition, these sweet, spicy, and savory chicken nibbles were the clear winner! They were gone in 60 seconds! 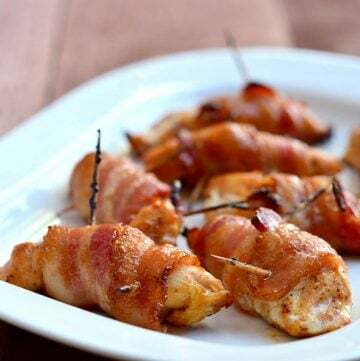 If you’re looking for simple appetizers to kick up your holiday get-together or game day shindig, put these baked bacon-wrapped chicken bites high on your list! 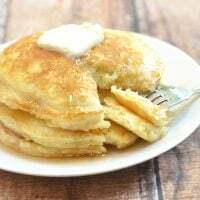 They are so easy to make with a short list of pantry ingredients, you can have them ready in a jiffy and be out of the kitchen to watch your guests practically inhale them! 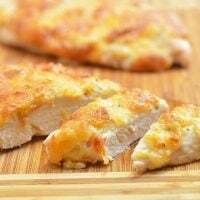 Make sure to use thin-cut bacon so it will cook congruently with the chicken. Bake the chicken tenders on a wire rack set over a broiler pan instead of in a baking dish. This allows the heat to circulate and help crisp the bacon all around. 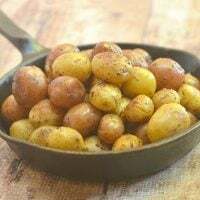 In a small bowl, combine chili powder, garlic powder, and pepper. Roll chicken tenders in chili mixture to coat. 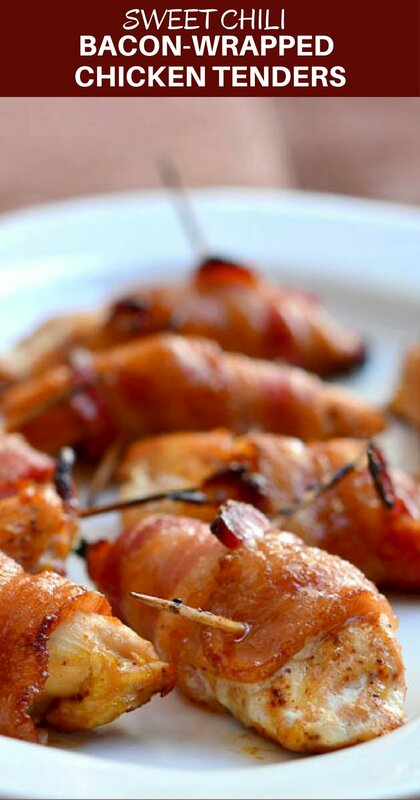 Wrap each chicken with bacon and using wooden picks, secure top and bottom of bacon. 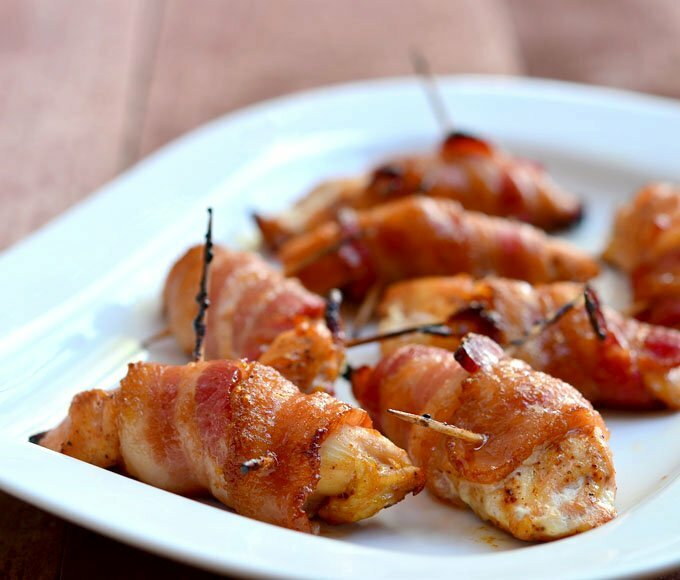 Gently roll bacon-wrapped chicken in brown sugar until coated. 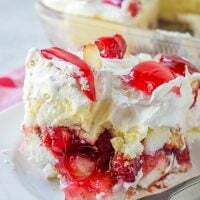 Arrange prepared chicken tenders on a wire rack set over a broiler pan and bake in a 350 F oven for about 20 to 25 minutes or until bacon is brown and crisp and a thermometer inserted in the chicken reads 165 F.
Broil for another 1 to 2 minutes to crisp up the bacon, if desired. Serve immediately. First published on December 22, 2013. How much black pepper do I use? Hi, I just noticed there are two different oven temperatures mentioned. Should it be 350 or 400 degrees?